In one of her books, Laurie Beth Jones asks a very good question, “What would you do if you were 10 times as bold for God?” Worth pondering, right? How about if we were 10 times bolder for the Earth? Maybe that can be our mantra for Earth Day this year–10 times as bold! What might that look like both personally and as a faith community? Your first question might be–when is Earth Day? It’s rolling around soon on Monday, April 22, less than two months away. So it’s high time for us to be thinking what we’re going to do, especially if it involves our congregation and us being 10 times bolder. Let’s try to imagine what we’d look like being that kind of person. Gone would be all our fears about not being good or smart enough to do something significant. We’d shed our cloaks of timidity, our “I’m-no-leader” identities, and our worries about what others might think. Our energy and creativity would kick into the highest gear, crowding out all negative voices in our heads or from others. We’d feel invincible and heroic, part of a long line of prophets and visionaries who changed the world. So there we have it. Now what are we going to DO? I know you’ll come up with some great ideas, but if you need a few suggestions, here they are. 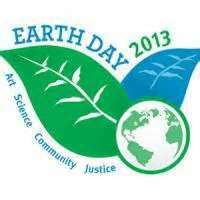 Be intentional about observing Earth Day (on Monday or the weekend before) much as you do a religious or civic holiday. Put up some decorations and have a dinner or party with family/friends around an Earth theme. Have fun and also invite them to take action like signing a postcard to the president or giving a donation to an environmental organization (hint: SSC happens to be one!). Make an Earth Day resolution to do some green action you’ve always wanted to do: cut down on meat, replace your toxic home products, cut your energy use in half, or being really bold, get solar panels on your roof. Subscribe to YES! Magazine, so full of hope and real people coming up with solutions. Get involved in the public sphere in some way. Join an environmental organization. Take a bus to Washington the next time an environmental rally is scheduled. Take part in 350.org or MoveOn.org local activities and petitions. Sit down with your clergy and dialogue about faith and environmental issues and what your congregation is and can be doing in response. If you don’t have a Green Team, talk about how you can start one. Invite them to give a sermon on Earth stewardship the weekend before Earth Day (and have them sign up on our website to be part of the 100 sermons project). See if they will give a percentage of the collection to an environmental cause or organization. If you already have a Green Team, have a big Earth day celebration at worship that gets everyone involved. (For a list of specific suggestions, click Earth Day Worship Ideas). Do a dynamite educational program that weekend. SSC can provide a speaker if you need one. Seek to get your members more involved in environmental advocacy and community endeavors. Advertise the Shawnee Mission Earth Fair on April 13. Hand out a list of environmental websites where they can sign petitions, or how they can take action regarding state environmental policies. Who can say what you might get going that will make a huge difference for the Earth? Just take the next step, a giant bold one or even a small step that stretches you, and see where it leads you. You won’t be alone, but have the support of infinite Spirit, all of creation, and thousands cheering you on!